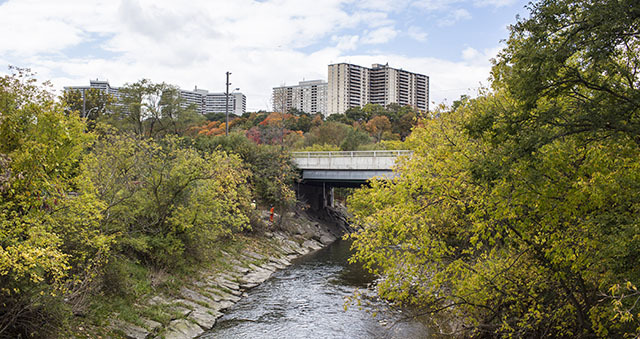 Building connections to and from neighbourhoods, the Park provides an opportunity for Torontonians and visitors to engage in cultural activities, enhancing the environment of an incomparable but undervalued asset—the Don Valley. Investing in our greenspace is vital to complement the urban core at a time when the pace and intensity of development in Toronto continues to strengthen. What better place to mobilize greenspace than at the intersection of our city where downtown meets the Valley and where the Valley meets the lake? The Park will continue to enhance the city’s identity for decades to come, just as the Valley itself has shaped Toronto’s past, present and future. 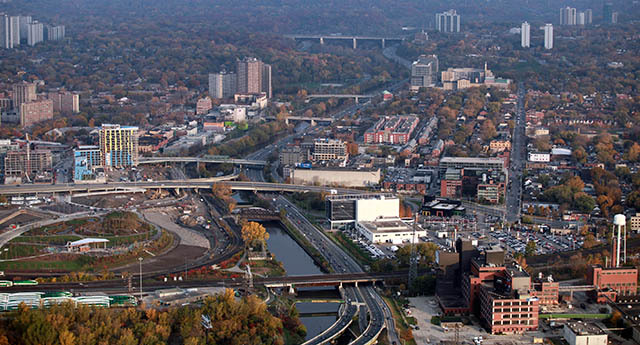 The Don River Valley Park is an outlet for citizens and a destination for visitors, connecting neighbourhoods and new developments to valuable parkland. Protecting the sensitive ecological features of the Valley, the Park’s landscapes help mitigate the impact of climate change in the flood-prone valley. The Park's unique landscapes help curb the affects of climate change in the Valley. The ravine boasts a diversity in trees and plants such as oaks, maple, birch and cedar. You can watch the great salmon run in the fall as they travel upstream, or watch the migrating birds return from their wintering homes! Take a walk beside the river’s edge for a moment of solitude, bike or walk the trails, or experience our art trail. Find out more about what you can do at the Park. The collaborative vision of the Don River Valley Park will transform Toronto the good into Toronto the great. From connecting Evergreen Brick Works through a marquee crossing, to connecting both Riverdale parks, east and west, through a massive land bridge, the future possibilities of the Don River Valley Park are endless. Scheduled park improvements include the opening of the Pottery Road pedestrian bridge and an accessible ramp from the Riverdale Bridge. Construction details, closures and projected opening dates can be found on the City of Toronto website.